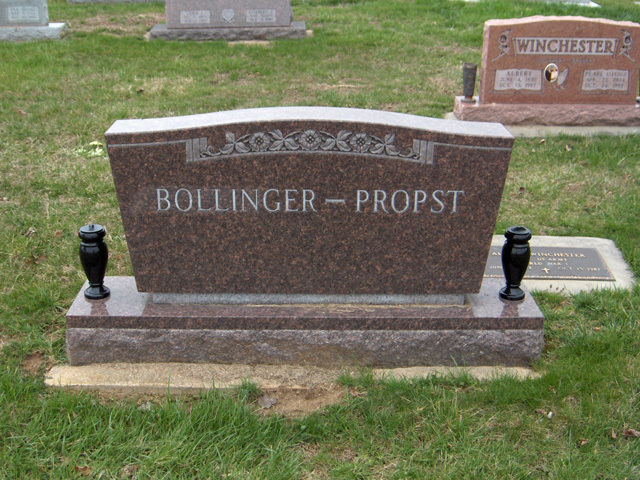 Jo Mayne E. Bollinger Propst, 92, of Marble Hill, MO; passed away Thursday, November 27, 2014 at the Sikeston Convalescent Care Center. She was born March 5, 1922 in Sedgewickville, MO; daughter of Gladys Orvah and Loutiche Marie Austin Bollinger. She and George Thurman Propst were united in marriage on July 19, 1941 and they were blessed with 62 years together before Mr. Propst�s death on March 5, 2003. She became a teacher at the age of 18, taught school in Bollinger County for 38 years, and subbed for 17 years after retiring. She taught K-9th grade. She loved her students. She was a member of the MO State Teachers Association, Retired Teachers of MO, Alpha Delta Kappa (an honorary teachers� association), Rural Letter Carriers Auxiliary of MO, DAR Bollinger Chapter and later The Kingshighway Chapter DAR of Scott County, and The First Baptist Church in Sikeston, MO. She was often known as �the peacemaker� as she always tried to promote peace in school and among her friends. Her family was considered by her to be her greatest accomplishment. She loved and enjoyed them, all 3 generations of them. She enjoyed nothing more than having those great grandchildren come to play with her. She was �Ma JO� to all of them and she loved all 5 of them. Survivors include her sons Terry (Brenda) Propst of Sikeston; Mitchell (Deronda) Propst of Cape Girardeau; two grandsons David (Peggy) Propst of Cape Girardeau; Darrin (Molly) Propst of Dexter; two granddaughters Tara and Ashley Jones of Cape Girardeau; and five great grandchildren, Brooks, Travis, Kyla Ann, Presley Propst and Aubrey Lynn Merriweather. She was preceded in death by her husband, parents, son Travis Dwayne Propst. Visitation will be Monday, December 1, 2014 from 9:00 to 11:00 AM at the Liley funeral Home in Marble Hill. Funeral services will be Monday at 11:00 AM with the Rev. Fred Ritter officiating. Burial will be at the Bollinger County Memorial Park Cemetery near Marble Hill. In lieu of flowers, memorial contributions may be made to the Alpha Delta Kappa Teachers� Sorority of Marble Hill, The American Cancer Society, or the First Baptist Church of Sikeston.